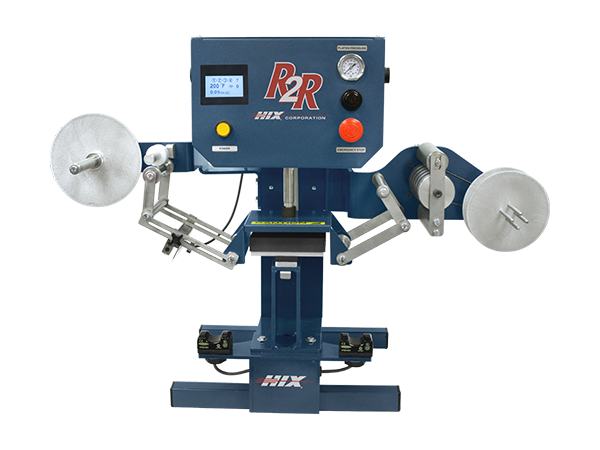 The HIX R2R R-45T Heat Press is for apparel manufacturers looking for alternatives for sew-in labels on their t-shirts. This can help reduce costs and also increase customer comfort. HIX R2R products are known for their speed, durability, and ease of use which is what separates the HIX roll label transfer process from the competition. Designed specifically for a high production of tagless labels, the HIX roll label transfer process works as quickly as 1 second on a variety of different fabrics and is sure to increase your companies productivity. Speed, durability, and ease of use separate the HIX Digital R2R from all other roll label transfer presses. Designed specifically for high production application of tagless care labels with transfer times as quick as one second on a variety of fabrics. Short web paths, tool-less web guides, and quick release lower platens decrease change-over times and eliminate excessive waste. User-friendly machine controls and a multi-color index reader ensure precise label placement. The HIX R2R easy load system requires no tools, sensor adjustment is simple and capable of reading either side of the transfer roll. The reader is programmable to detect virtually all colors in the spectrum in one quick step. Digital controls guarantee precise heat and time control, the core-less take-up reel makes discarding spent roll stock quick and easy with no need for tape or spare cores. The HIX R2R is the perfect solution for your tagless applications.